It is not difficult to understand that individuals with hampered ability to recognize social cues, interpret interpersonal data, and process the long term outcome of antecedent/behavior/consequence will at some point also have hampered ability in the realm of sexuality. 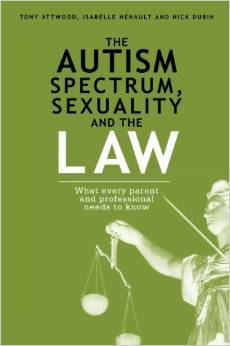 The premise of this book is to take a specific circumstance, that of Nick Dubin, and make that circumstance tangible and educational for individuals affected by Autism, their families, care providers, doctors, therapists, and legal counsel. That is a lot to ask of one book. Unfortunately it falls short of the mark, not because it doesn’t aim properly, but because some of the contributors don’t make the effort to put power into their pull. Dubin’s tale is disturbing because it is both relatable and abhorrent. His story will be particularly difficult to accept by those who were victims of childhood abuse. At the same time, so much of the story is believable and creates compassion for Nick and his family. Nick’s chapter and his mother’s chapter are least beneficial in terms of actual education and material. By contrast, Nick’s father’s chapter is gripping, and filled with applicable information from the very beginning. It is worth the read of this book simply for this section. It may have been preferable to have an entire book written in this voice. Tony Attwood’s section is perhaps the most disappointing. His section reads like a university psychology student’s homework assignment, writing 500 words based on a bullet list of subjects. Considering some of the monumentally influential work Attwood has contributed to the field of ASD literature, it is disappointing. He does include a nice list of reading suggestions for the reader to pick up from their local library or bookstore, if they are seeking more specific information. Dr. Isabelle Henault’s section concludes the book, and is secondary only to the section written by Nick’s father. Henault does the work that we previously expected of Attwood, as she takes the reader through developing sexuality, how social and relational deficits in conjunction with targeted bullying and conflicting sexual sensory data can cause those on the autism spectrum, particularly those with Asperger’s Syndrome, to struggle with their sexual identity. Many will confuse issues of privacy and legality. Henault provides information for therapists and psychologists, assisting them in identifying risk factors and in assisting their clients as they navigate this new and confusing territory. This book is not for those who are teaching emerging adolescents about their sexuality. Books on that subject matter, such as Sexuality and Relationship Education for Children and Adolescents With Autism Spectrum Disorders by Davida Hartman, are great guides on the specifics of adolescence and sexuality. The Autism Spectrum, Sexuality, and the Law is appropriate for those who feel they, or their clients, are already struggling with this intense issue.